Claddagh is an Irish word (it means a stormy beach) as well as a place in Ireland near Galway, on the rocky west coast of that country. 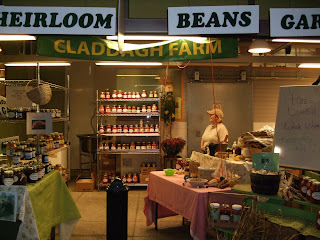 One of the vendors at Findlay Market is Claddagh Farms, which sells homemade sauces, jams, jellies, herb mixes and more. They have a granola with whole, roasted almonds and steel-cut oats that has become a favorite nosh of mine. 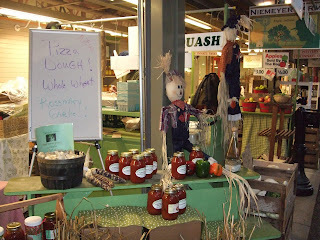 And their homemade tomato (pasta) sauce is loaded with garlic from their fields. If you get there soon, you may still find bulbs of fresh garlic. It is SO much better than the stuff you get at the supermarket, you will be amazed. Let's sing the praises of the Mediterranean diet! It's mostly plant based, with protein coming from beans, fish and a little bit of meat now and then. Most nutritionists have come to the conclusion that it may be the healthiest way of eating in the whole world. 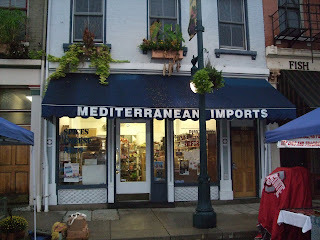 A great source for a wide selection of olive oils and other prepared foods and delicious ingredients is Dean's Mediterranean Imports (108 West Elder St.) at Findlay Market. Dean Zaidan, who hails from Lebanon, has operated the shop for years but recently expanded the store and renovated the floors above it, where he now lives. Dean is a friendly, fun guy, so be sure to ask for him when you stop in. Four of us had dinner last night at Mecklenburg Gardens on University Ave. in Clifton, and met the landmark restaurant's new chef, David Bach. Bach helped Sean Daly open Hugo's in Oakley a few years ago and then moved on to other restaurant gigs, including Nada, the downtown Mexican place that's part of David Falk's restaurant group . "When this opportunity [at Mecklenburg) came up, I grabbed it," Bach said. He's been there just two months and the menu is still the same as it's been for awhile. Here's hoping that Bach will be able to put his own twist on the German-accented cuisine without straying too far from the formula that has kept the restaurant perking along since its reopening in the mid-'90s. 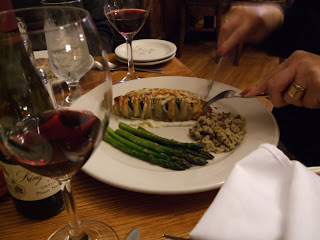 Pictured above are the pecan-crusted walleye and a chicken strudel. I just returned from the first annual Farmers Fair on Greenup Street in Covington, where I met the chefs from downtown Cincinnati's newest--and most exciting--restaurant. 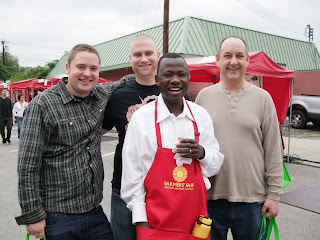 Chefs Steven Geddes (in photograph at left) and Kyle Johnson (far right) were passing out copies of Local 127's menu amid the booths staffed by Kentucky farmers, artisan food producers, Elk Creek winery, Dojo Gelato, and more. They found no better place to schmooze with likely customers than at this locavore event. In fact, several of the restaurant's food sources were represented at the fair. Local 127 (127 W. 4th St., formerly Jean-Robert at Pigall's), calls itself a "New American eatery" that "provides only the freshest ingredients, prepared with a respect for tradition using the innovative tools of today." The menu, divided into SMALL and LARGE plates, looks like a healthy foodie's dream: plenty of vegetable based dishes, and much of the meat is healthy too because it comes from farmers who treat and feed their animals humanely and healthfully. The result is lean, high protein, low fat meat full of minerals and "good" fats. I chatted with the chefs (pictured with friends Brent Balika, second from left, and Ike Like) and learned that they plan to open a wine bar in the coming weeks or months and also will expand to include lunch service. As of now, Local 127 serves dinner Tuesdays through Saturdays. We have not gotten there yet, but will do so ASAP and report in detail about what these foodies are dishing up that night. Honey, a top-notch restaurant in Northside, celebrates its 4th anniversary this weekend with special menus. 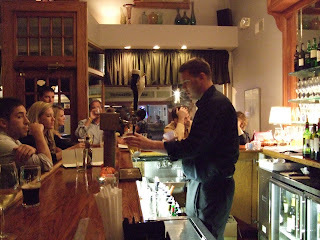 We went Friday night to sample items from their very first menu (2005). Saturday night (9/26) the anniversary specials get ramped way up as they feature a couple dozen of their all-time "best" (most popular) dishes. I got a sneak-peek at the menu and it is amazing. How does "Truffle and Wild Mushroom Ravioli in a pool of Cointreau laced chicken broth with celeraic creme fraiche" sound? Or seared diver scallops atop braised pork belly and sweet pea puree topped with fresh peaches? Going very healthy is also an option--try the "House-made dumplings of Ransohoff Japanese eggplant and elderflower liquor in a pool of vegetable broth and julienne cabbages." Save room for dessert--or at least a cup of the killer, spicy (but not extra rich) Mexican hot chocolate. 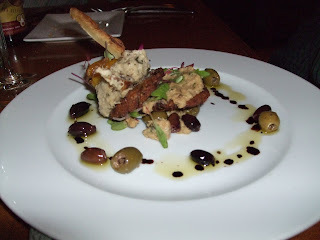 Photos with this post show a special "Provencal" appetizer from Friday's dinner, as well as a shot of the lively bar. 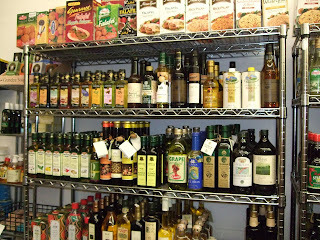 Cooks often use aromatic vegetables and herbs to enhance the flavor of stocks, soups or stews. Typically, the vegetables include onions, carrots and celery (and their relatives, such as leeks), while the herbs are those with distinctive aromas, such as thyme, rosemary or lemongrass. This vegan dish starts with an aromatic-veggie base, then adds peppers, mushrooms, tomatoes and spinach along with cannellini beans. I spooned it over polenta disks sauteed in a little olive oil, but it would be just as tasty tossed with multigrain pasta (such as penne or farfalle) or piled on a mound of rice. 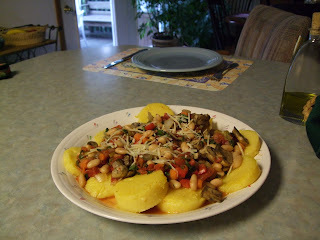 Serve over pasta, brown rice or polenta. I don't know any better place for an inexpensive, healthy lunch near U.C. (where I work) than Cilantro Vietnamese Bistro. (No website so no link.) Most of the time, I carry out a couple of the "soft rolls," pictured above. Try both the pork and shrimp or the tofu--they're equally tasty, chock full of lean protein and crunchy raw veggies, and they come with a sweet, tasty peanut dipping sauce. They're only $1.70 each! It's enough lunch for me. Bigger appetites should try one of the noodle bowls, also pictured. They also make salad bowls--fewer carbs and calories, and quite filling. 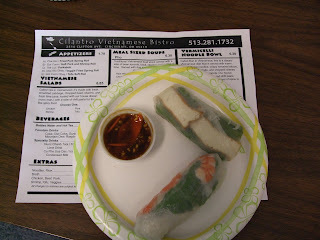 Cilantro is at 2510 Clifton Avenue, across from Hughes High School and a block from the U.C. Law School building. On Sunday afternoon, over 125 foodies braved the weather to gather at Turner Farm in Indian Hill, OH, for the first annual "Lunch on the Land" yum-fest. An array of Cincinnati's most prominent and talented chefs--from Julie Francis (Nectar) to Josh Campbell (World Food Bar) and Jean-Robert de Cavel (pictured above)--cooked a delectable five-course meal, with each course accompanied by wines selected by Vanguard Wine Imports' Jeff Hickenlooper and donated by The Party Source. Highlights? 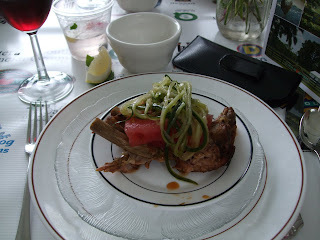 The first course of beer braised baby back ribs served with pickled cucumber and watermelon was outstanding, if not necessarily a stellar choice for the health-conscious. It was really delicious, though, and did not seem fatty at all. 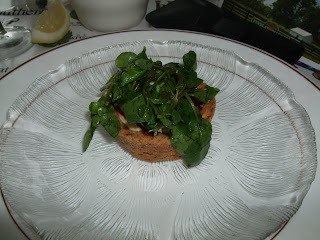 My husband's fave was the second course, a beet, goat cheese and pistachio tart topped with locally grown watercress. Shots of each of those are with this post--the tart is at the top, and the ribs below. The wines were interesting, but our favorites there were a 2007 Angels Landing Stags Leap Cab Sauv and (biggest surprise) the Tomasello Blueberry Wine served with dessert. 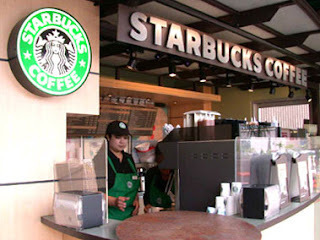 If you've been reading your Starbucks paper napkins lately, you've noticed that the coffee chain (finally) has gotten rid of trans fats in their pastries. They also claim to have eliminated artificial flavors & dyes along with high-fructose corn syrup. Those are steps in the right direction. But as I stand in line looking at the pastry case, I still have a hard time seeing anything I should eat--fat and calorie-wise. Once in awhile they have a pastry that's promoted as healthier--whole grains, fruit-based--but most of the time, not. On Friday 9/18, my article about lunch at Take the Cake (Northside) is in the Weekend section of the Cincinnati Enquirer. 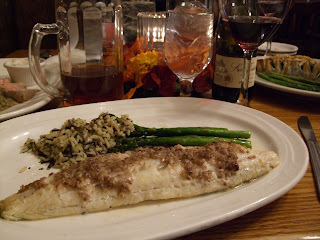 Skate (or skate wing) frequently turns up on French bistro menus--I used to love the version served at Brasserie le Coze in Atlanta--but you won't find it in your local supermarket's seafood department. If you shop at a fish vendor who also supplies our best restaurants, however, you can get lucky. 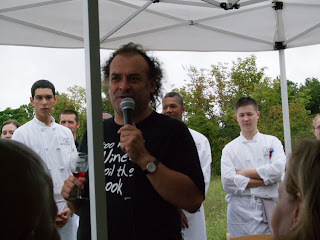 When a local chef puts it on his/her menu, the supplier may very well have extra to sell to the public. 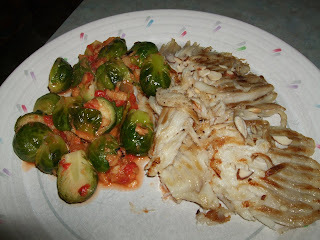 Lately, Luken's Seafood at Findlay Market has been bringing in skate for Jean-Ro Bistro and I was able to score some for a recent dinner at home. It's not expensive--maybe $7 or $8 a pound, and absolutely no waste because it's boneless and skinless. Skate is delicate and thin, so you can cook it in just a few minutes. Add salt and pepper to each side of the fish. Heat the oil in a nonstick frying pan over medium-high heat and add the skate. Cook 3 minutes and carefully turn the fish with a spatula; cook another 3-4 minutes. Reduce heat to low, sprinkle with remaining ingredients. Remove fish to serving plates and voila! These two dishes were the main courses for a party last weekend. We served them with herbed foccacia and a couple of red wines. Heat a grill or grill pan to medium-hot. Add pork loin and sear one side for about 2-3 minutes. Turn and sear the other side -- pork should be browned on all sides. Add figs to grill -- you may need to use a grill insert with small holes so that figs do not fall through grate. Cover and turn heat down to medium. Cook for another 3-4 minutes, depending on thickness of loin, turning once. Stir figs to cook evenly. Meanwhile, heat lentils and beans in the microwave until steaming, then arrange on a platter. Remove pork and figs from the heat. Be careful not to overcook the meat--it's really tastier if the pork is still pink in the middle. Place pork on a cutting board and slice thickly. 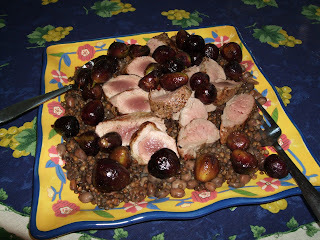 Arrange pork slices on bed of lentils and sprinkle figs around the platter. Brush tuna and salmon with canola oil and grill until medium or medium-rare, to taste. Set fish on a cutting board and allow to cool. Meanwhile, toss beans, potatoes, tomatoes and capers with half the salad dressing. Toss remaining dressing with lettuce. Combine all ingredients except fish in a large serving bowl or platter. 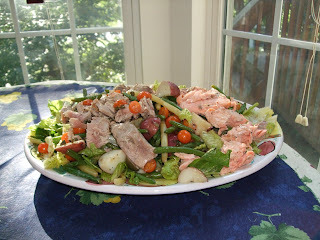 Slice salmon and tuna and place atop salad. Serve immediately. 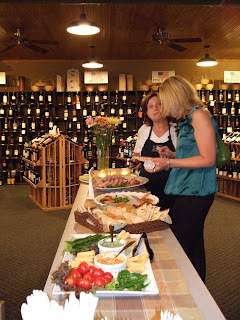 Most Friday nights, the caterer Art of Entertaining and their wine store, Uncorked, hosts an end-of-week party at their location on Madison Road in O'Bryonville. They pour three white and three red wines and accompany it with a nice array of foods, all well paired with the featured wines. The cost is $22 per person, tax and gratuity included. Here's a shot from the tasting of Friday 9/11. There's a nice outdoor patio leftover from the days of the restaurant Chateau Pomije in that space--a wonderful place to enjoy the wine and food while the weather holds. Here's an unusual (& healthy) way to get more chocolate into our diet--not that we have too much trouble doing that. 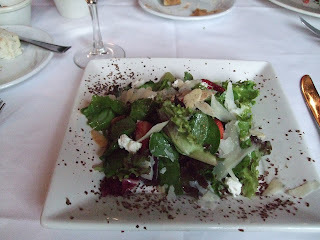 At Crippen's Restaurant in Blowing Rock NC, they served this salad with shaved chocolate on it. Mmm, mmm. The salad included mixed greens, sliced strawberries, crumbled goat cheese, shaved Parmesan and toasted almonds with a black pepper-Dijon vinaigrette. And of course the chocolate topped it off. Try this at home, and amaze your family and/or friends. 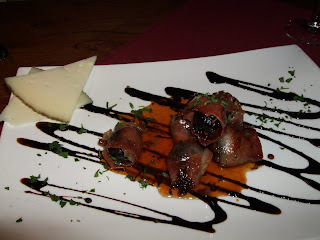 At Bistro Roca (Blowing Rock, NC) our favorite dish was grilled figs wrapped in prosciutto, topped with a balsamic vinegar reduction and served with slices of Manchego cheese. 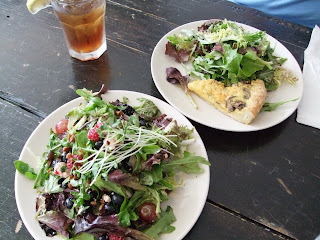 It was wonderful, but rich--not something healthy foodies should eat very often! So I got to thinking about ways to lighten it up. First, cut the amount of prosciutto to just enough to wrap around each fig (secure with a toothpick); that will cut fat and calories significantly. You could also skewer them, several to each skewer, instead of using a toothpick. Grill until the prosciutto is just crisp. Meanwhile, simmer 1/4 cup of balsamic vinegar in a saucepan until reduced to a couple of tablespoons, then drizzle that over the hot figs. Eliminate the manchego :-( or grate a little bit of it onto each plate, which makes the cheese go further. Grilled figs are delicious, no matter how you serve them. This weekend I plan to make grilled marinated pork loin with grilled figs--I'll blog about that and let you know how it turns out! Bring 4 cups water to a boil. Add salt and pasta to water, bring back to a boil and cook until just tender. Drain pasta and keep warm. Meanwhile, heat oil over medium-high heat in a large skillet. Add zucchini, mushrooms and pepper. Reduce heat to medium and stir-fry until veggies are tender, about 5 minutes. Add water and tomato sauce. Stir until heated through. Add pasta to the skillet, stir well, and sprinkle with chopped basil. 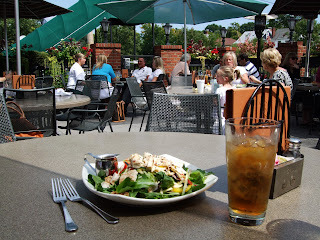 While we're having this great spell of weather, find your way to a rooftop bar and/or restaurant. 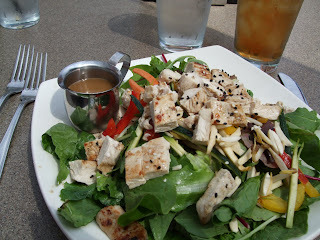 My friend and I had lunch at Teller's on Hyde Park Square today and enjoyed a meal-sized Asian-style chicken salad. It had lots of tender chicken cubes (good protein) and a few julienned veggies atop a plate of greens. 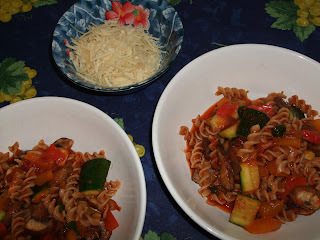 The miso vinaigrette was not too oily & made these healthy foodies happy. Another rooftop bar my husband and I like is at Chez Nora's in Covington--more for the lively scene than for the limited menu. Anyone know of other rooftop spots worth visiting while the weather is fine? Tammie Stanley brings dozens of types of flowers to Findlay Market on Saturdays, a small sampling of the "75 +" varieties that she grows on her farm in Williamsburg, OH. "Some women buy shoes," she says with a laugh. "I have hundreds of varieties of seeds--and maybe 3 pairs of shoes." 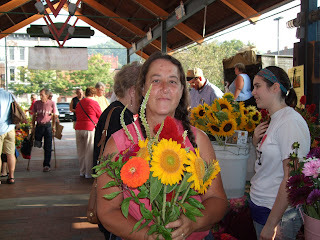 Tammie started as a vegetable grower but found her niche with flowers when she first came to Findlay Market eight years ago. She uses no conventional fertilizers, pesticides or herbicides on any of her flowers. Tammie will make you any size bouquet you want for as little as just a couple of dollars. P.S. 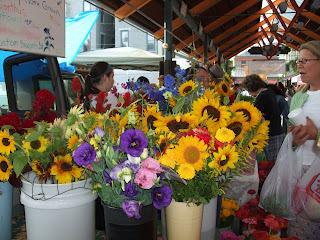 -- I know this isn't about food, but while you're at the market for flowers, buy some healthy fruits and veggies, too. I've always liked Chipotle better than any other fast-food restaurant, and now I've learned that they are leaders in supporting sustainable, humane, organic food production methods -- going against the grain of our industrial food system and accepting lower profits as the cost of taking this stand. "[T]he Mexican fast-food chain Chipotle...now sources its pork from Niman Ranch*and gets its other meats and much of its beans from natural and organic sources. 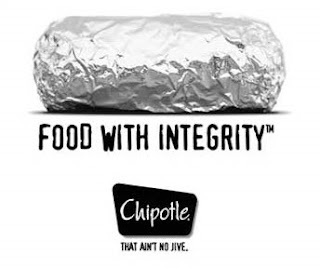 It's part of a commitment that Chipotle founder Steve Ells made years ago, not just because sustainable ingredients were better for the planet but because they tasted better too--a philosophy he calls food with integrity. 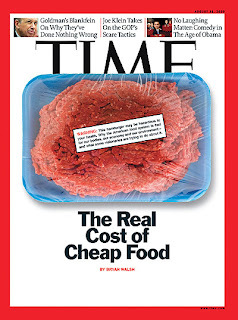 It's not cheap for Chipotle--food makes up more than 32% of its costs, the highest in the fast-food industry. But to Ells, the taste more than compensates....'We put a lot of energy into finding farmers who are committed to raising better food,' says Ells." Bravo and three cheers, Chipotle! By the way, early in this decade McDonald's was a majority owner of Chipotle, but it pulled out in 2006. The company has thrived since then and now has more than 500 locations, including more than 15 in metro Cincinnati. * Niman Ranch "has knitted together hundreds of small-scale farmers into a network that sells all-natural pork, beef and lamb to retailers and restaurants. In doing so, it leverages economies of scale while letting the farmers take proper care of their land and animals."